How much kapikacchu is recommended to take each day? How do I use kapikacchu to support my overall reproductive system? What herbs can I include with kapikacchu to support my reproductive system? How do I use kapikacchu to assist in healthy libido and stamina? How do I use kapikacchu to help manage stress? Why is kapikacchu such a great herb for supporting my nervous system? How do I use kapikacchu to support my nervous system? How do I use kapikacchu to help balance my vata? Why are many of the suggested ways to use kapikacchu the exact same while the reason for taking it can be entirely different? Are mucuna and kapikacchu the same herb? How many milligrams are in a teaspoon of kapikacchu? What is levodopa, or L-dopa, and how is it related to kapikacchu? How much levodopa is in your kapikacchu? What can you tell me about the relationship between kapikacchu’s L-dopa and Parkinson’s disease? Where does your kapikacchu come from? 1. How much kapikacchu is recommended to take each day? Our general suggestion is to take anywhere from ¼ to 1 teaspoon per day, and you can use this range in all of the following suggestions. There is a broad range because each situation is different and each person may need more or less of an herb to bring balance. Try starting with a lower amount and build over time until you reach your desired amount. 2. How do I use kapikacchu to support my overall reproductive system? 3. What herbs can I include with kapikacchu to support my reproductive system? Kapikacchu is often used in combination with amalaki, ashwagandha, shatavari, vidari kanda, and gokshura for added reproductive support.2 Many of these herbs are a part of Men's Support and Stress Ease formulas. 4. How do I use kapikacchu to assist in healthy libido and stamina? 5. How do I use kapikacchu to help manage stress? Kapikacchu powder can be added to warm water or warm milk, and you can enjoy this at any time in the day or evening. Stress Ease is another option: this formula combines kapikacchu with ashwagandha, shatavari, brahmi/gotu kola, and guduchi (among other herbs), and it is a rejuvenating and nourishing formula that helps you cope with stress. 6. Why is kapikacchu such a great herb for supporting my nervous system? Kapikacchu is a nervine and a tonic, and both qualities support the nervous system.4 Kapikacchu is a natural source of levodopa, or L-dopa, which is a precursor to the neurotransmitter dopamine. This is a technical way to say that it can help you feel calm and relaxed. 7. How do I use kapikacchu to support my nervous system? Add the powder to a cup of warm milk and a little honey; the combination with milk and honey will enhance kapikacchu’s restorative qualities.5 You can use ghee as an alternative to milk if you desire. Ghee will also support kapikacchu’s restorative qualities. Take it at night to fully experience the herb’s rejuvenative effects: the herb will work while your body sleeps. Stress Ease tablets are another option: the majority of the herbs in the formula – kapikacchu, ashwagandha, brahmi/gotu kola, guduchi, and gokshura – are all excellent for supporting a healthy nervous system. 8. How do I use kapikacchu to help balance my vata? Making a nourishing, warming tea is a great option: add the powder to warm milk or water and drink it at any time that works for you. 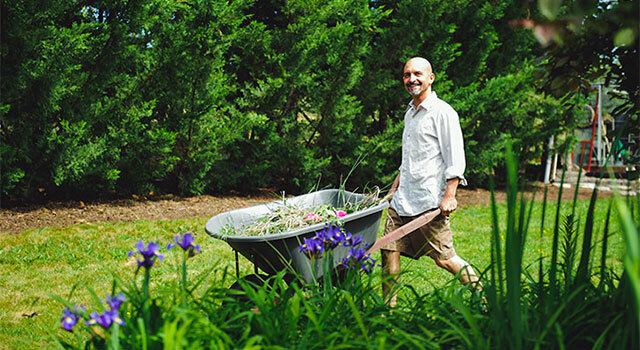 You can also take Healthy Vata; as the name implies, this formula was created to bring balance to vata. It harnesses the energy of kapikacchu and enhances its ability to support vata by combining it with many other herbs that can address vata imbalances. 9. Why are many of the suggested ways to use kapikacchu the exact same while the reason for taking it can be entirely different? Kapikacchu works in different systems within the body, especially the nervous and reproductive systems,6 and it has different actions that helps the body regain balance in these different systems – it is a nervine, tonic, and aphrodisiac, to name a few.7 You can use the same mode of intake for different situations (for example, add it to warm water or warm milk), and kapikacchu will go where it is needed in your body. While you can enjoy kapikacchu on its own, you can also enhance kapikacchu’s efficacy in a particular system by taking some of the herbal combinations suggested, or try our formulas in tablet form that contain kapikacchu, such as Healthy Vata, Stress Ease, or Men's Support. The herbs complement each other: the presence of the other herbs not only help direct kapikacchu’s potency within the body to a particular area, but they also bring out every other herb’s actions, making the formulas well-rounded and effective. 10. Are mucuna and kapikacchu the same herb? Yes! 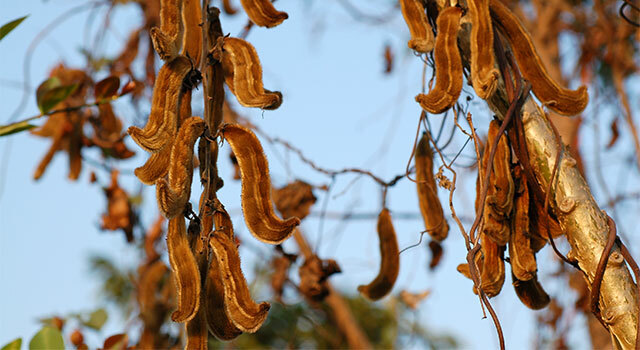 Kapikacchu is the Sanskrit name, while “mucuna” is part of kapikacchu’s botanical name (Mucuna pruriens). 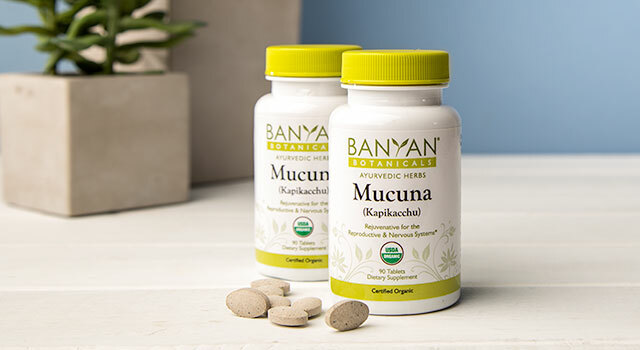 Banyan uses both: we sell our bulk powder under the name kapikacchu while we sell our liquid extract as mucuna. Though we use different names, it is the same herb. 11. How many milligrams are in a teaspoon of kapikacchu? There are approximately 3500mg of kapikacchu in one teaspoon. 12. What is levodopa, or L-dopa, and how is it related to kapikacchu? Levodopa, commonly called L-dopa, is an amino acid that is naturally found in kapikacchu. L-dopa is a precursor to the neurotransmitter dopamine. 13. How much levodopa is in your kapikacchu? The concentration of Levodopa in our kapikacchu is approximately 4-5 percent. Concentrations can vary from season to season depending on environmental conditions. 14. What can you tell me about the relationship between kapikacchu’s L-dopa and Parkinson’s disease? Dietary supplements such as kapikacchu are not intended to treat, cure, or prevent any disease. Kapikacchu is a natural source of L-dopa and supports a healthy nervous system. Whether it is useful for people with Parkinson’s disease is a matter to discuss with your health practitioner. 15. Where does your kapikacchu come from? Our kapikacchu is grown and harvested in Karnataka, India. This creeping vine can be found all over India, and it especially loves tropical regions, making Karnataka an ideal environment. 1 Dr. David Frawley, OMD, Ayurvedic Healing: a Comprehensive Guide (Salt Lake City: Passage Press, 1989), 294. 2 Dr. David Frawley and Dr. Vasant Lad, The Yoga of Herbs (Twin Lakes: Lotus Press, 2001), 245. 3 Frawley, Ayurvedic Healing, 295. 4 Swami Sada Shiva Tirtha, The Ayurvedic Encyclopedia: Natural Secrets to Healing, Prevention, & Longevity (Bayville: Ayurveda Holistic Center Press, 1998), 91. 5 Sebasatian Pole, Ayurvedic Medicine (London: Singing Dragon, 2013), 206. 6 Pole, Ayurvedic Medicine, 206. 7 Tirtha, Ayurvedic Encyclopedia, 91.